Wow, this year’s winter storms have been something else! They have done a number on our roads as well as on the floors in our buildings and homes. One place we might not know that is really being hurt by the storms, though, is the carpets beneath our feet. Ice melt, which is the mixture of salt and ice or snow, can really take a toll on carpeting if it is not cleaned quickly and properly. 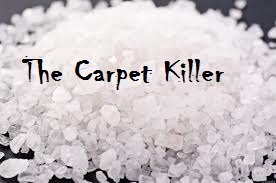 Even after the water evaporates, the salt crystals can remain embedded in carpet and destroy the carpet fiber. The most effective way to protect your carpets from ice melt is by using walk-off mats, both inside and out, to keep the salt from reaching your carpet. They are worth the purchase. 1. Vacuum your mats and carpet using a wet/dry vacuum. You may have to do this a couple times per day. 2. After the mats and carpet are dry, vacuum them using a traditional vacuum, with the brush bar making good contact with the fibers. 3. Vacuum mats and carpet in multiple directions. Do this slowly in the worst areas. 4. If the salt stain are still visible, you may need to use a stiff plastic bristle brush to dislodge the crusted salt. 5. If the residue still won’t break loose, call us! And if you’re in the Chicagoland area, make sure that you call us at Unique Upholstery Carpet and Rug Cleaning when the snow, ice and salt season has passed for a deep carpet cleaning! The only salt we track in comes with the sand on our feet when we come home from the beach … 😉 … but I know it’s valuable information to so many, especially THIS winter!